The most amazing thing about Terry Zwigoff’s documentary on underground cartoonist R. (Robert) Crumb is its redefinition of what is “normal” in society. The very first title in the film alerts us to this: “David Lynch presents”. Lynch’s films illustrate the dark underbelly of American normality by placing the surreal and grotesque in everyday situations. Crumb also touches on cultural alienation and the nature of fame, all through the prism of the “1950s” family. Zwigoff, Crumb‘s director, has been R.’s friend, publisher and musical collaborator for over 30 years (he played in R.’s band the Cheap Suit Serenaders). Given R.’s propensity for privacy, and his general hatred for the media in all its forms – he declared the feature cartoon of his Fritz the Cat (1972) an “embarrassment” – it’s unlikely that Crumb would have been made without Zwigoff. 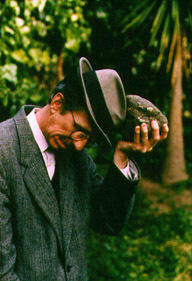 In its form, Crumb appears to be a conventional documentary biopic (interviews, family sequences, pro and con criticisms); in its content, however, it reveals itself to be extremely subversive. The theme of “represented” reality is directly related to this radical rethinking of what a documentary can present. The Crumb brothers were brought up in the 1950s, often represented by The Adventures of Ozzie and Harriet, Father Knows Best and other icons of home, hearth, love and security. By contrast, Crumb’s father – a salesman who conformed to white-collar America – died early, a broken man, disappointed in his “wimpy” sons. He was abusive, and his wife took refuge in amphetamines. The boys then vented their anger internally, living a confined existence within society: for example, R.’s brother Charles lives in a darkened household with his mother – the curtains are kept closed, giving it an air of repressiveness and decay – and he rarely leaves the house. R.’s other brother Maxon, a former molester, lives in a skid-row apartment, goes out begging and sleeps on a bed of nails. It is in these details that we might remember David Lynch’s credit, and his cinema of psychosexual dysfunction; except this isn’t a fiction. A level of controversy has arisen about whether Crumb is voyeuristic, whether to view the brothers as freaks. As we get to know them, however, it becomes obvious that the brothers loathe the very idea of conforming. R. himself wrote in his diary early on: “I decided to reject conforming when society rejected me”. This summation could be applied to all three brothers, characterising the powerlessness they feel within society. (The brothers’ two sisters refused to be interviewed, and one wonders how different the film would’ve been with their participation.) Indeed, Crumb – titled thus for all three brothers – is distinguished less by what R. says about himself than by his difference from the people around him. It moves from being a simple biography to implicate each viewer as it explores how the experiences of childhood create the adult. It is during these family scenes that Crumb becomes a rejection of the lies and squalid promises of our culture, not only a riposte to what is deemed “normal”, but also as a starting-off point to R.’s artwork. His solace in his old jazz and blues records is in contrast to his depictions of modern America as a mechanised, advertised wasteland where repressive prejudices run amuck. As children, Charles became a sort of mentor to R., but his sexual obsession with Treasure Island led to his art devolving into acute grapho-mania. R., no less talented, gradually evolved his own artwork to appeal to the outside world; amazingly, he has somehow avoided becoming Charles or Maxon. Art critic Robert Hughes acclaims R. as a contemporary Breughel or Goya, an artist who refuses to shrink from the truth. The ruling ideologies in America, Utopianism and Puritanism, forced R. to go underground; his work will never be mainstream. Fellow artist Trina Robbins and journalist Deirdre English – re-evaluating R.’s work within the autocratic bounds of political correctness – criticise his alleged misogyny and racism; an ex-girlfriend invokes his infidelity and emotional dishonesty. (The gargantuan women he draws can just as readily be read as empowering.) Yet in his comics – whether he draws himself or adopts characters such as George “Murky” Murkoid, with his constant erections – the characters have an indelible honesty that is full of contradictions, mixing self-loathing, egotism, hatred and fear. This has made R. popular within the underground scene, particularly in the 1960s. Ironically, R. actively rejected the fashionable Haight-Ashbury crowd as yet another subculture that would’ve rejected him had he not become famous. (Even though he hung-out with some of the hippies in order to get some Free Love.) What was that famous Groucho Marx quote? “I don’t care to belong to any club that will have me as a member”. Last year’s American Splendor (Robert Pulcini and Shari Springer Berman, 2003), the excellent biopic of Harvey Pekar (the writer of many of R.’s comics), is another valentine to the terminal outsider. Actor James Urbaniak played R. in a small role; the performance didn’t have the raffishness and self-deprecating humour of the real Crumb (though it did suggest untapped rage). Rather, he appeared more stolid and full of confidence, in direct contrast to what we see in Crumb. What would the real R. Crumb have thought of this onscreen persona? Probably shrugged his shoulders and said, “Oh my Gaaad”.